This simple command hook hack will save you time, frustration, and will make party prep a little less stressful! Who doesn’t have time for that! download your free SUPERHERO files! My son turned two on August 26th. TWO y’all. How do I have a two year old?! 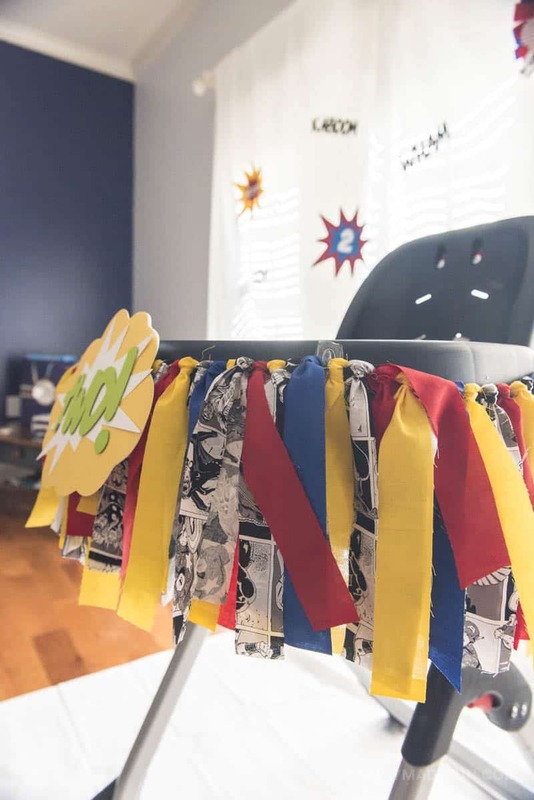 It seems like I was planning his party for months (which, let’s be honest here….I was) and I was so excited to craft and diy all the things for it. But when it came down to it I realized that in-between buying a house, moving in, painting, and putting things away I had very little time left to craft. So I stuck with doing only the simplest of things and that had to be good enough for the party. Lazy crafting for the win! Y’all know how much I like easy craft projects that I can knock out during nap time. And of course, my toddler’s second birthday was no different. Almost everything took 20 minutes or less and it all turned out SUPER CUTE. I mean, a superhero theme is adorable no matter what but I loved all the stuff we came up with. Pin it to your Party board on Pinterest & Follow Simply Made Fun for more crafts! The main thing we did was hang vinyl tablecloths on our big windows facing the deck with lots of hero terms sprawled across it. But the one craft I was really excited about was the banner for the high chair. We found this adorable black and white Marvel fabric at Joann Fabrics and then got bright colors to go with it. Lots of pops of red, yellow, and blue everywhere really made the entire theme come together from room to room. But the one thing I kept struggling with was how to hang the banner correctly so that it would stay all day long. All I needed was a creative command hook hack to save the day! So here’s how it happened. + I cut the pieces of fabric as long and wide as I want (it was 2.5 inches by 7 inches). + Next I took the string and wrapped it around the toddler’s high chair. I wrapped it one and a half times before cutting it to make sure there was plenty of string to tie a bow in once all the fabric was on it. + Then I tied the string around a chair so that it was easy to tie the pieces of fabric onto it. It kept the string in place and made it so much easier to quickly and easily tie everything on. + And finally, it was time to tie the fabric onto the string! I also cut out superhero words and other paper pieces with my Silhouette machine that I placed on top of the fabric banner and all around the house. You can grab your own files here (in PDF + SVG!). I’m usually all about those quick and easy projects, but this one took a little more time than most. But it was only because of all of the measuring and cutting! This is one of those projects you should sit in front of the tv and do just because it’s tedious and a little time consuming. When the day of the party rolled around I kept trying (and failing) to tie the banner around the high chair and it just wasn’t working. I couldn’t figure it out and I was getting frustrated because time was racing by and I had more stuff to get done. Command Hook Hack to the rescue! Earlier in the week I bought these tiny command hooks to keep some tv cords next to the fireplace. 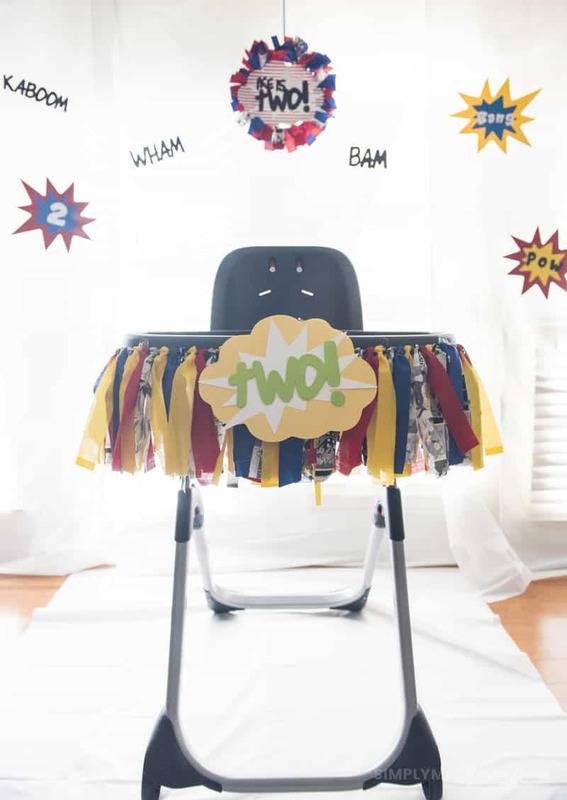 I had extras so I figured I could try to use them on the high chair for the banner and if you haven’t guessed yet….it worked! I spaced them out along the tray on the high chair and they held up the banner nicely. It even withstood the weight of cake and icing all over it as the toddler threw his all over the place. I’m sure this command hook hack isn’t new to the world but man is it new to mine. And now I’m obsessed! This hack is so useful and so helpful. I can’t wait to use it to hang fun holiday decor! What other command hook hack ideas have you come across? Any other fun uses for them that you want to share with me? I’d love to hear them! This is such a smart idea! I’ll definitely be using this trick for Greyson’s birthday party! Thanks Madison! 🙂 Have you decided on Greyson’s theme yet?!! I can’t wait to see what you do with it!